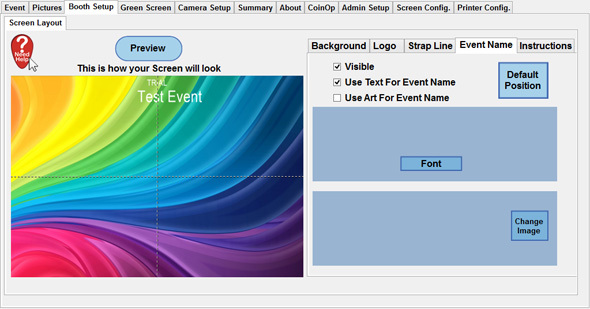 Of course you will want to customize the opening screen of the software, which is where the Booth Setup >> Screen Layout is useful. Here you can change the Background Image or Colour, Change the Logo (be it text or a graphic) as well as adding in a strapline and the Event Name. All of these options can be positioned anywhere on the screen to suit your needs. Alter the background colour by Selecting the Use Colour For Background tick box, then tap or click on the Select Colour Button to choose your background colour. 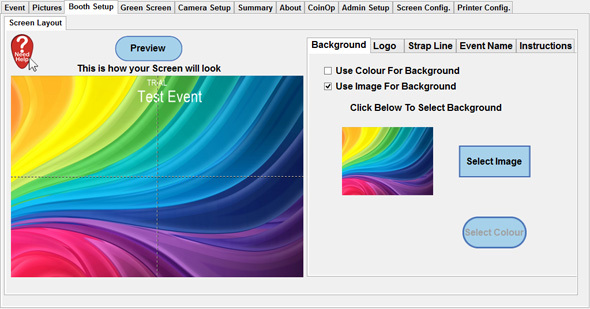 Or if you would prefer an image background tick the Use Image For Background option and Click Select Image. For following popup will appear. Where you can select your new background, or if you want to add on click the Green + top left of the window to find a new background image. For an onscreen Logo you can either have text or a Image file. Select either Use Text For Logo or Use Image For Logo or if you prefer not to have either you can deselect Visible. Click Change Image to be presented with alternate images in a popup window and add your own image to the list by Clicking the Green +. If your unable to see the Logo on the preview click on the default position. Click and Hold down on the Logo Image/Text in Preview to move it to the desired position. To enable or disable a stapling of text Select or de-select the Visible option where appropriate. Enter your own text in the provided text entry box and click Change Text to update the screen. If the strap line is not visible Click on the Default Position button. Change the font and colour of the strap line text by clicking on the Font button. Click and Hold down on the Strap Line Text in Preview to move it to the desired position. 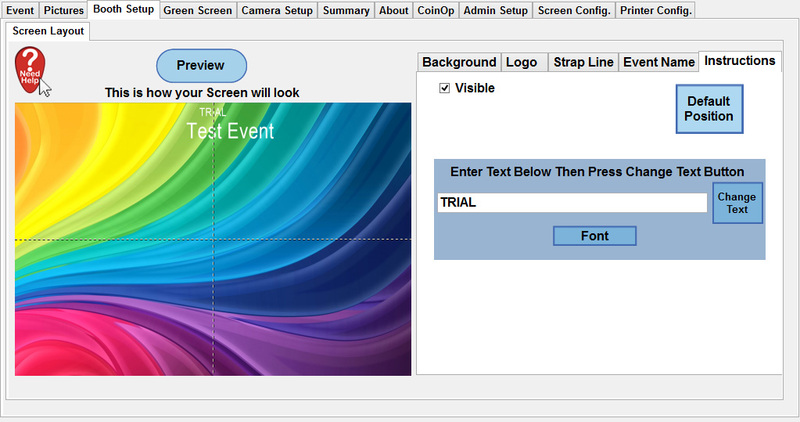 For the onscreen EventName you can either have text or a Image file. Select either Use Text For Event Name or Use Image For Event Name or if you prefer not to have either you can deselect Visible. Click on Font to change the Font and Colour of your text if required. If your unable to see the Event Name Text/Image on the preview click on the default position. Click and hold down on the Event Name text/logo in the Preview screen to drag the item to where you wish. The Instructions can be moved positionally anywhere on the screen. Change the font by clicking on the Font Button and Also select if the instructions are to be shown by selecting or de-selecting Visible. Click Change Text to update the preview screen, and click Default Position if your unable to see the Instructions Text. If you click on the Instructions Text in the preview Window you can drag the Text around to the place you want.